Health foods has become one of the biggest food trends of the year quickly and in Canada, Toronto is at the heart of it with several places catering to people looking to eat healthy and delicious foods and there's everything from juice bars to smoothie bowls and vegan restaurants. It can be hard to eat healthy and stay fit as a busy student with a limited budget but these options are student friendly. A big contributor to feeling good and looking good is determined by what we consume. Our bodies work as machines and we must feed them with adequate, nutritious fuel. Here are a few health spots around the city that will help please your palate and cleanse your body. 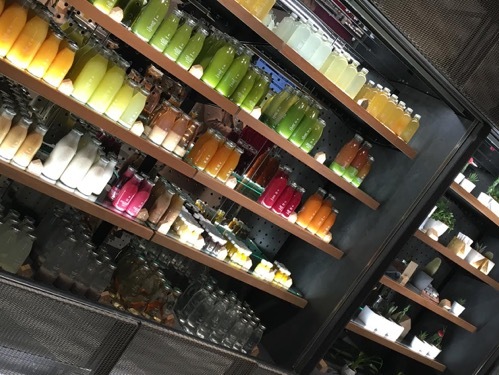 Tucked away on Queen Street West, Daily Press Juicery is a quaint, local juice shop. It's intimate, cozy and beautifully decorated, Daily Press is the perfect spot for a date, study session or just an afternoon snack. Their juices range from typical greens to charcoal lemonade – and in the summer, they sell fresh-pressed watermelon juice for $5 – a must try. All of their products are organic – which is why the prices are a little high but the taste and health benefits are definitely worth it. Juice Recommendation: Beach Bum – a refreshing mix of coconut water and fruit that comes in both big and small sizes, it's the perfect thirst quencher or post-workout drink. Nut Mylk Recommendation: Mylkilicious – a smooth mixture of nuts, organic sweeteners and cinnamon that makes for a velvety, sweet, heart-healthy snack, breakfast or dessert. Smoothie Recommendation: Choco Chip – a delicious blend of almond milk, cacao nibs, dates and more, this is the perfect healthy imitation of a rich chocolate milkshake without the empty calories, processed sugar or bloated sensation. Photo taken by Samantha Chazonoff. Nestled on beautiful Yorkville Street, The Good Press lies. A small yet lively shop with just one seating bench – The Good Press is the perfect spot to grab a healthy breakfast or snack on the go. The service is quick and the staff are friendly. The bowls are hearty and filling and reasonably priced for their nutritious properties and overall quality of the ingredients. Bowl Recommendation: The hippie bowl–featured is the only bowl on the menu with creamy almond butter. The mix of granola, nut butter and fresh fruit make the perfect protein-packed snack or meal. Juice Recommendations: Black Beauty is a delicious, refreshing fruity beverage and for another alternative, the Chocolate Milk is a homemade nut milk found in the fridge with the cold-press juices and it's a thick, creamy, dairy-free take on a chocolate-y classic. Greenhouse Juice Co. has many beautiful locations around Toronto and is another healthy brand. Juice Recommendation: Apple. It's simple and sweet and a completely organic take on a classic juice with no added sugar, yet a lot of flavour. It's found in many local spots around Toronto including “Basil Box,” apple makes for the perfect lunchtime beverage without the guilt. Another option is their infamous Pink Milk, a sweet mélange of beets, natural sweeteners and almond milk help support liver, enhance stamina and manage weight and it also happens to be creamy and delicious. Smoothie Recommendation: Rococoa, a raw take on a famous chocolate shake. If you’re a chocoholic, healthy takes on velvety drinks serve as perfect substitutes! The creamy texture of the almond milk base paired with the sweetness of bananas and date, make for a chocoholic’s guilt-free heaven. Photos taken by Samantha Chazonoff. So, don’t forget to look out for chocolate’s healthy twin this season – cacao and its list of benefits make it a vital superfood that you should include in your diet ASAP. In an effort to protect your heart, lower blood pressure and naturally boost your mood – it’s clear that a healthy twist on chocolate milkshakes could be doing a lot more than just satisfying your sweet tooth without affecting your tummy.